A while back, my beloved husband starting using a new scent of deodorant that smells just like lemon muffins. I am a huge fan of this, except that it makes me hungry for lemon muffins, which I have not had the opportunity to obtain of late. 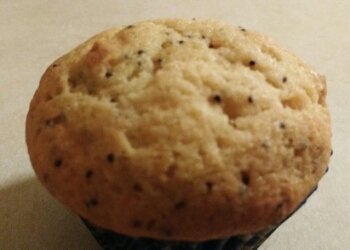 So today I had some spare time, and also had (in anticipation of just such an occasion) ordered some poppy seeds and lemon powder from Penzey’s (<3 them!). Aha!, I thought, Finally, it is time to satisfy my craving! I pulled out a bowl and whisked together two cups of sugar, a cup and a half of milk, some lemon juice, three eggs, a cup of vegetable oil, and a splash of vanilla. Then I added in three cups of flour, and grabbed the salt out of the cabinet. Except it was stuck. See, our spice cabinet is a tad full these days (thanks to the aforementioned Penzey’s) (still <3 them!) so the salt somehow got relegated to the top shelf, where it not only needed to be tilted a particular way to get it out, but also it was kind of wedged in between some other things. So I yanked on it, and it finally popped out…and slipped out of my hand. Now, I know you’re probably thinking it landed in that big bowl of almost-dough and things got a little messy…but you’re wrong. No, it did not land in the bowl. It smacked the edge of the bowl at just exactly the right angle to flip the bowl, depositing the not-yet mixed dough all over the counter, floor, and me. Some years ago (pre-kids so at least 11, but probably more), there was a recipe on the side of Jello pudding for “Five Minute Pie”. I was extremely skeptical. Oh, sure, I thought, they say “five minutes” but that probably only includes the time to put everything in the bowl or something. In my kitchen experience, nothing ever takes less than twice as much “prep time” as indicated by the recipe. But…it did sound delicious. And easy. So what if it did take 10 or 15 minutes to throw it together? That’s still pretty quick, right? So I ga thered everything up and started whisking. I’ll be damned if that pie wasn’t in its crust and ready to eat in 5 minutes, including package opening time. The next one I made, I took to a party. Everyone was SUPER impressed. What a lovely chocolate mousse pie I had made! I absolutely must give them the recipe! Holy cannoli, this 5 minute pie thing was a huge hit! I started making it for everything. You can fancy it up by piping on the whipped cream or adding chocolate shavings. People will think you’ve spent hours on this thing. And it really is very tasty. I lost the recipe a while back, but thanks to the interwebs have recently rediscovered this magical, mousse-ical pie. I’ve been seeing a thing on food blogs lately where it’s a bajillion pictures of the same thing and you have to scroll forever to get to the actual recipe. So I won’t be doing that, ever. BUT, I thought I might try doing some step-outs in the recipe itself. I’m not sure I like it, but let me know what you think! 2 boxes chocolate pudding The regular size, not family size. 1 container Cool Whip The regular size tub, not the giant one. 1 1/4 cups milk I use skim, because that's what we have on hand. Use what you have. 1 pre-made cookie crust I like the chocolate ones, but the Nilla wafer or graham cracker ones are fine, too. The Oreo ones are little too intense for this recipe. Servings: I mean, it's a pie. I could probably eat a whole one by myself, but if you want to share cut it into as many slices as you like. Whisk pudding and milk together until fully combined. Whisk in half of Cool Whip. Mixture will be very thick. Mousse-like, even. Spoon mixture into crust and spread evenly. This is me, joyfully eating a thing for which you will find the recipe below. So, obviously I did not make it back to Make’n’Tell last month. I still haven’t finished that sweater, though the end is finally in sight (and it turns out the deadline was May 12, not April, so at least I didn’t actually miss the deadline). I’ve been sick with allergies and busy doing lots of stuff with family (both the one I live with and my derby one), so I haven’t been making much, or at least not making new stuff. Although, now that I think about it, I did cook quite a bit, and I really should have blogged that. One of the things I cooked(baked) was these delicious oat-nut bars — I love them for breakfast, and used to make them all the time, but I ran out of coconut oil and never restocked. But a member of my derby family recently was hospitalized with bacterial meningitis, and we wanted to show her some love at our last bout by baking some treats in her honor. I picked these because they remind me of her: Sweet, full of goodness and energy, a little nutty, and totally awesome! I originally found this recipe on Half Baked Harvest, and modified it just a tad (mostly by adding the nuts). A quick energy boost in every bite of these delicious bars. * I have made this with different flour ratios depending on what I have on hand and it comes out just fine. ** You may sub another oil or combination of oils -- I sometimes do a few tablespoons of flax seed. *** Use whatever chocolate you like. The batch shown has all of the leftover chocolate chips I had -- semi-sweet, dark, bittersweet, even a few minis and some white! **** Y'all, my baking life has completely changed since I started lining things with parchment paper. If you prefer to butter or spray your pan, you do you. But I'll be over here stuffing my face full of these delicious bars while you're washing that pan. Make’n’Tell Day 4*: Worst. Muffins. Ever. No, for real. I made these to take to my fantabulous fellow clinic escorts tomorrow, because I’m team lead and that’s what we do. But seriously, these are on the top 10 list of most disgusting thing I’ve ever put in my mouth. Just nasty. So I’ll be buying something delicious in the morning for my team. Maybe I should bring these for the protesters. *You may have noticed I skipped day 3. No big mystery — I just didn’t make anything yesterday (Wednesday)…I had a really full day and was exhausted. I knitted a couple of rows on a pair of fingerless mitts I’m working on, but not enough to count for mnt. I’m not beating myself up over it, just resolving to do better going forward.